With just a few trading days left in 2011, we can take stock of gold’s performance vis-à-vis other assets. Gold is 13.7% higher in USD, 12% higher in GBP and 14.4% higher in EUR. Gains were seen in all fiat currencies and even stronger performing fiat currencies such as the CNY (yuan) and JPY (+9% and +8.75% respectively). Stock markets globally had a torrid year with the S&P500 down 1.3%, the FTSE down 8% and the CAC and DAX down 19% and 15% respectively. Asian stock markets also fell with the Nikkei down 17%, the Hang Seng 20% and the Shanghai SE down 22%. The MSCI World Index fell 9%. Thus, gold again acted as a safe haven and protected and preserved wealth over the long term. While gold reached record nominal highs at $1,915/oz in August, it is important to continually emphasize that gold remains well below the real high, adjusted for inflation, in 1980 of $2,500/oz. Gold today at $1,625/oz is 18% below the record nominal high of $1915/oz in August 2011. More importantly, gold remains 46% below its real high of $2,500/oz. Since 2003, we have said that gold would likely reach the real high from 1980 for a variety of important fundamental reasons – such as global debt levels, global demographics and geopolitical, macroeconomic, monetary and systemic risk. 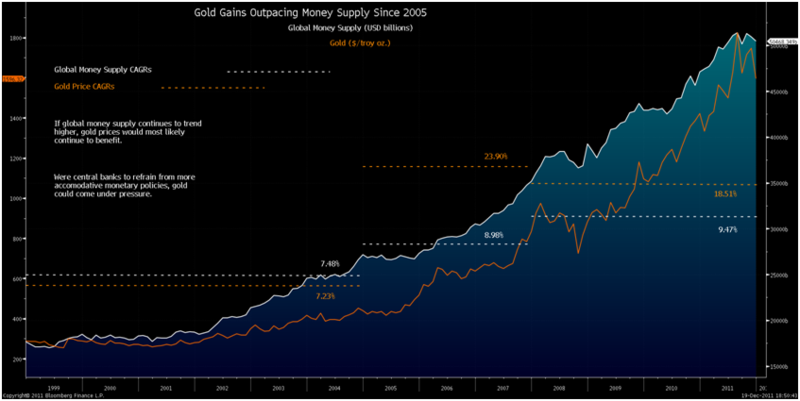 Global money supply continued to rise in 2011 and helped push gold prices to all-time highs on the fear of currency debasement. If accommodative monetary policies continue as the dominant tool for central banks, precious metals will almost certainly continue to benefit. Were this trend to turn, responsible monetary policy actions could hinder returns. We see no prospect of this in the short term – and little prospect in the medium term. Central banks have bought about 30 million ounces of gold since March 2009, about 12% of global demand on trailing 10-quarter basis. As central banks focus on stimulating growth, negative real interest rates in developing nations should continue to push diversification of foreign exchange reserves, which may encourage bullion purchases. Central bank gold reserves are likely to return to the levels seen in the 1970’s and 1980’s due to a significant reappraisal of monetary risk and a recognition of gold’s increasing importance as a monetary asset. China, one of the largest buyers of U.S. Treasuries, has publicly said that it intends to continue to diversify its foreign-exchange holdings. 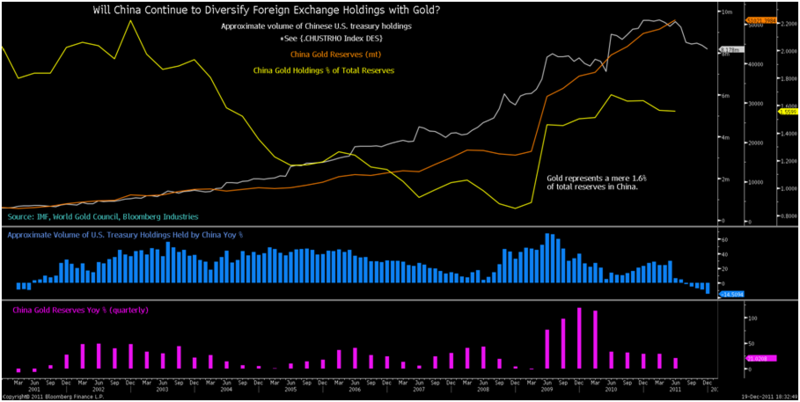 The total volume of China's Treasury holdings appears to be showing the first yoy declines in 10 years while gold reserves continue to increase by about 30% a year. Creditor nation central banks gold holdings remain very small when compared to western debtor nation gold holdings which are generally well over 50%. It is important to note that the People’s Bank of China’s gold reserves (officially at 1,054 tonnes) remain very small when compared to those of the U.S. (8,133 tonnes) and indebted European nations - such as Italy with 2,452 tonnes. China's growing gold reserves are miniscule when compared with China’s massive foreign exchange reserves of over $3.1 trillion. 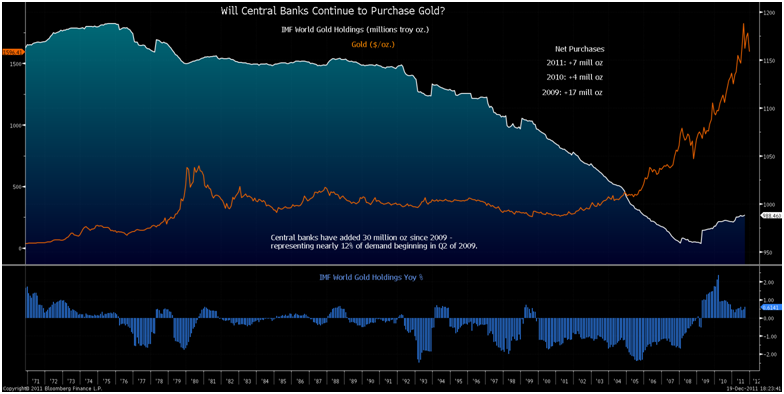 The People’s Bank of China is almost certainly continuing to quietly accumulate gold bullion reserves. Common sense alone strongly suggests that they are. As was the case previously, the Chinese government will not announce their gold bullion purchases to the market in order to ensure they accumulate their gold reserves at more competitive prices. They also do not wish to create instability or falls in or runs on the dollar and or euro – thereby devaluing their sizeable reserves. The steep declines of Iceland's krona in 2008 and Argentina's peso in 2002 show how gold can outperform in a depreciating currency. As the likelihood of default increases, the bulk of the gains in gold priced in the currency are realized within the first few months. The people of the so called “PIIGS” - Portugal, Italy, Ireland, Greece and Spain – are all at risk of currency devaluations. Some estimate the risk as high, others low but investors and savers in these countries should protect themselves by having an allocation to gold that will protect them from “bank holidays” and currency devaluations. However, it is not just the “PIIGS” who are at risk. The risk in periphery European nations will likely be of a sharp overnight or weekend devaluation (or a series of such devaluations) and reversion to their national currencies. However all nations, PIIGS and non PIIGS alike, are at risk of currency devaluations and currency wars. Currency wars and the debasement of currencies for competitive advantage poses real risks to the long term stability and prosperity of all democracies in the world and to the finances and savings of people in all countries. Current market turmoil is likely to continue and may even deepen. The prospect of sovereign defaults is real which could see confidence in paper assets, particularly sovereign debt, further erode. Contagion means that even AAA rated debt is no longer risk free. 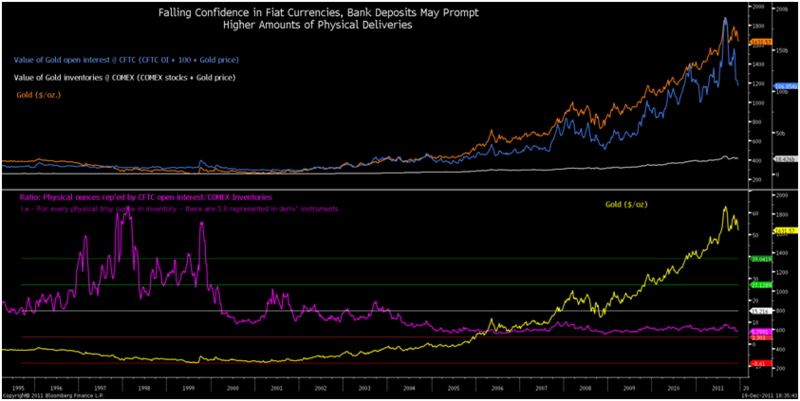 Institutions and high net worth and retail clients taking physical delivery of gold given a decline in confidence would put pressure on exchanges to deliver because the amount of metal represented in open interest is nearly six times (5.8) the amount of metal in inventory. Forgive us for continually emphasizing how gold is a historically and academically proven safe haven. We feel it is very important that investors and savers understand this and are frustrated by the continuing significant degree of ignorance regarding the gold market and gold’s role as a diversification, a store of wealth and a wealth preservation asset. Some of the media and some experts continue to focus solely on gold’s price and not its value as a diversification for portfolios. Many economists and other experts have been suggesting that gold is a bubble for a number of years and suggested that again at the beginning of 2011 and again recently. ‘Is Gold a Bubble? 14 Charts, the Facts and the Data Suggest Not’. Many of the charts were long term in nature (2000-2011 and 1970-2011) and remain important today. Whether gold is a bubble or not is not the fundamental question. What is far more important is that there is now a large body of academic and independent research showing gold is a safe haven asset. Numerous academic studies have proved gold’s importance in investment and pension portfolios – for both enhancing returns but more importantly reducing risk. The importance of owning gold in a properly diversified portfolio has been shown in studies and academic papers by Mercer Consulting, Bruno and Chincarini, Scherer, Baur and McDermott, Lucey, Ciner and Gurdgiev and by the asset allocation specialist, Ibbotson. An academic paper, ‘Hedges and Safe Havens – An Examination of Stocks, Bonds, Oil, Gold and the Dollar' by Dr Constantin Gurdgiev and Dr Brian Lucey and was presented in November at a conference hosted by the Bank for International Settlements, the ECB and the World Bank. This excellent research paper clearly shows gold's importance to a diversified portfolio due to gold's "unique properties as simultaneously a hedge instrument and a safe haven." Oxford Economics research on gold in July 2011, showed how gold is a good hedge against inflation as well as deflation. Only last week, more excellent independent research was released confirming gold's unique role as a diversifier and foundation asset in the portfolios of investors, especially at a time of heightened currency, investment and systemic risk. 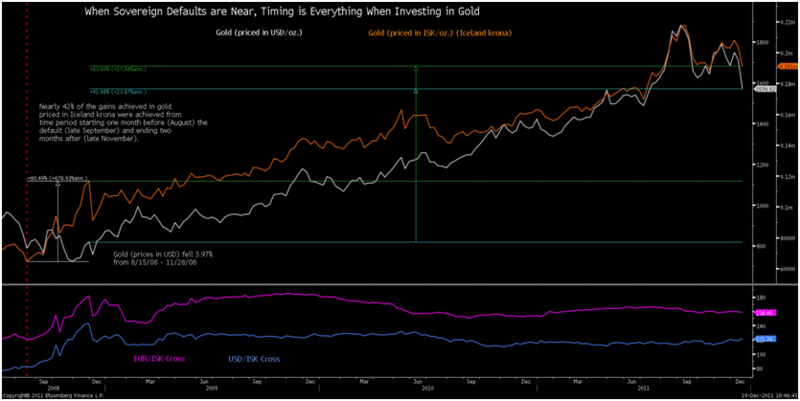 The independent research once again confirms the importance of gold as a portfolio diversifier to investors and as a store of wealth. Many market participants and non gold and silver experts tend to focus on the daily fluctuations and “noise” of the market and not see the “big picture” major change in the fundamental supply and demand situation in the gold and silver bullion markets – particularly due to investment and central bank demand from China, the rest of an increasingly wealthy Asia and creditor nation central banks. Support for the price of gold should come from the rising global money supply coupled with increasing investor and central bank purchases which have been driven by falling real interest rates and concerns about the euro, the dollar and other fiat currencies as stores of value. Tighter monetary policies, as seen in the late 1970’s, would likely help alleviate fears of further currency debasement but it is extremely unlikely that this will be seen in 2012. Indeed, ultra loose monetary policies, debt monetization, competitive currency devaluations and global currency wars look set to continue – if not intensify. Gold will likely reward investors internationally in 2012 as it did in 2011 and will again be an essential diversification for anyone wishing to protect and grow wealth in what will be a very volatile 2012 and in the coming volatile years.